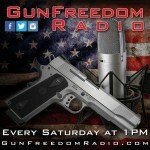 GunFreedomRadio EP6 Who Will Protect Us? Why Do We Need Protection? GunFreedomRadio EP5 Who Needs A Gun? Theme: Who Needs A Gun? Guest: Carrie Lightfoot, founder and owner of The Well-Armed Woman, LLC, and founder and Chairwoman of the Board of TWAW Shooting Chapters Inc. a 501(c)3 Non profit organization with 230 chapters in 50 states. Named in Newsmax as one of 2015’s 100 Most Influential Pro-Gun Rights Advocates. Theme: The SAF and The 100 Club Guests: -Alan Gottlieb from The Second Amendment Foundation -Sharon Knutson-Felix the Executive Director of The 100 Club, as well as with the 2015 The 100 Club Scholarship Recipient Courtney Dubois.